Best staff ! Very accommodating ! Very modern and clean ! Very nice room, staff friendly. Everything was very modern and clean. Good hotel in the city . Stayed there for the New Year’s Eve party . Hotel was good , party not the greatest . Best hotel to brunch at Brunch Room after a partynight at IO Rooftop. Trendy and stylish, the hotel surely exceeded expectations. Very clean. Great views! We loved the rooftop access. Rooms were modern and loved the price. I was really excited about this hotel when I booked it! But unfortunately, I was very disappointed with the overall customer service from ththe front desk! With the reputation of the hotel, I was expecting a more pleasant crew! There should be some training to make the staff a little more welcoming! The gym is very limited, but clean! On the upside, we checked in extremely early and was able to get a room right away! The room was clean, spacious and very comfortable! The location was perfect, walking distance to many great restaurants... I am not sure if I would stay here again, as I travel every year to Chicago for Work! So noisy during the night. The fitness a little bit small. The room was great, I like the size of the suit. Everything was perfect. The rooms were very clean and the staff were really nice. Love that you can text your requests to the front desk. Great hotel and location if you are new to chicago this is a fantastic place to begin your stay. I was there for a four day stay..the ambiance is somewhat cold..but on the whole I was happy about my choice to stay at the Godfey. Great location and fun hotel vibe! 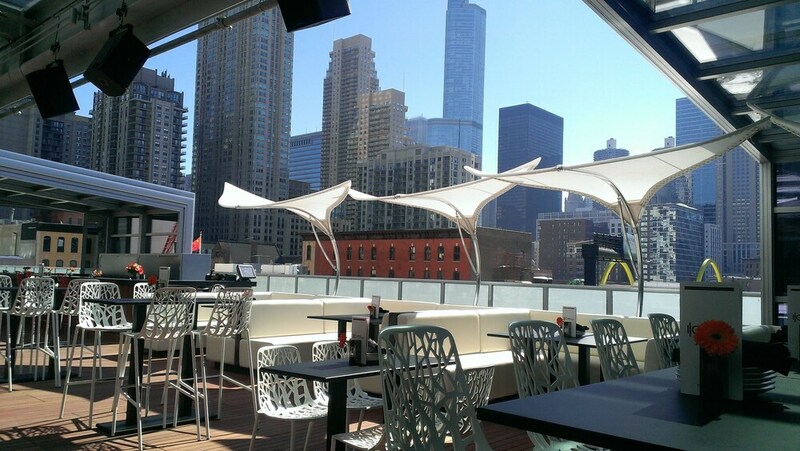 Rooftop bar has great apps and cocktails and lively music. Hotel rooms are comfy and nicely decorated! Great location! Convenient to most major attractions and great restaurants. Rooftop bar was great! My wife and I stayed here on our first, "just the two of us" vacation in years. The Staff was excellent, service was excellent, the view from our 8th floor room was good, and we were in close proximity to all of the dining, sightseeing, and activities that we wanted. We made plans to come back with our kids before we even finished this trip! This hotel was one of the best values that we've ever gotten on lodging. We didn't have to rent a car. We got to most places by walking, and we learned that we could take the train and a bus into town instead of using uber/lyft, so that's how we got back to the airport. This hotel is home to 2 onsite restaurants, perfect for a quick bite to eat. Order from room service to satisfy your hunger without leaving your room. Start each morning with full breakfast, available for a fee from 7 AM to 11 AM. Thank you for your feedback, and for staying with us! Thank you for choosing Godfrey Hotel Chicago. Thrilled to hear you enjoyed your stay with us. Thank you for your review and for visiting with us. I/O Urban Roofscape - Rooftop bar specializing in American cuisine. Open daily for brunch and dinner. Alfresco dining available (weather permitting). DOLCE - Restaurant and bar specializing in Italian cuisine. Open daily for brunch, breakfast, lunch, and dinner. Recreation features at The Godfrey Hotel Chicago include a 24-hour fitness center.